Pasinex Resources Limited (CSE:PSE)(CSE:PSE.CN)(CNSX:PSE)(FRANKFURT:PNX) (The "Company" or "Pasinex") is pleased to report a net income of $863,030 for the 1st Quarter 2017 as a result of a strong profit from its 50% owned Horzum AS Joint Venture company ("JV company"), in Turkey. All dollar amounts are Canadian unless otherwise indicated. The Q1 2017 unaudited financial results and the corresponding Management Discussion and Analysis (MD&A) are available on SEDAR.com and the Pasinex website. The financial results for both Pasinex and the JV company are provided. The positive financial result of Pasinex is wholly contributable to the strong financial result from the JV company. Below is a review of the JV company financial results followed by a review of the Pasinex financial results. 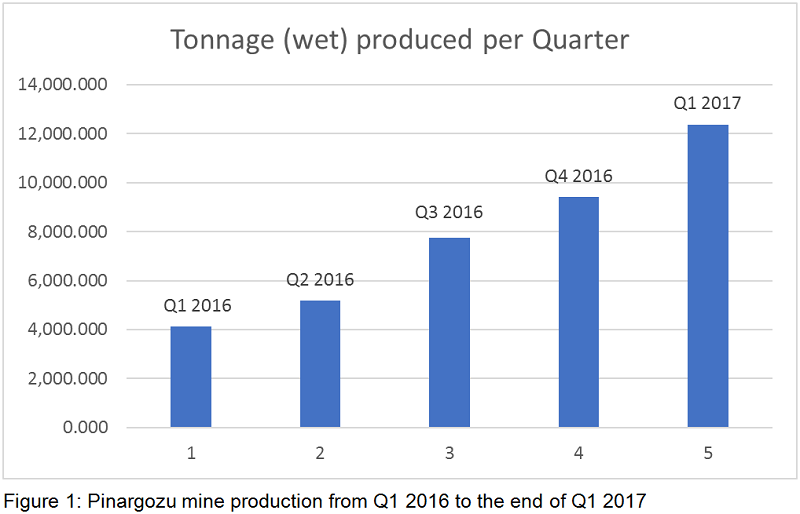 In Q1 2017, the JV company zinc mine in Turkey (Pinargozu) produced and sold 12,378 tonnes (wet weight) of direct shipping ore (DSO) with an average grade of about 32.3% Zn and about 140 tonnes / day of mine production. Sales revenue totaled $5,846,959 or approximately $472 / tonne of ore mined. Figure 1 below shows the production chronology over the past five (5) quarters. Production from the Pinargozu has steadily increased through each of these five quarters due in large part to the addition of a new third adit at the mine in August 2016. The total cost for the JV company in first quarter 2017 was $2,925,309 or about $236 / tonne mined. These costs included all mining, administration and exploration costs for the quarter. The net profit (before tax) for Q1 2017 was $2,921,650, which represented at 50% pre-tax margin. As a result of the profit realized in the JV company, Pasinex recognized a $1,168,289 equity gain on their income statement for Q1 2017. The equity gain led to a net income for Q1 2017 of $863,030 ($0.01 per share) after deducting operating expenses of $314,879. Total assets for Q1 2017 were $5,275,763 up from $4,065,789 at the end of 2016. Total liabilities were $224,958 down from $282,818 at the end of 2016. Shareholder's equity was $5,050,805, up from $3,782,971 at the end of 2016. Steve Williams, CEO commented, "Pasinex's quarterly results continue to be very gratifying because they show increased profitability as a result of the strong contribution from Horzum AS JV company in Turkey. We continue to see a step up in production at the Pinargozu Mine which led to lower cost per tonne mined and greater profitability. We expect this strong performance to continue throughout 2017. We anticipate continued solid earnings throughout 2017 and a great year for Pasinex and our shareholders. We invite you to have a more detailed look at the financial results and the MD&A." Pasinex Resources Limited (CSE:PSE)(CSE:PSE.CN)(CNSX:PSE)(FRANKFURT:PNX), a metals company, is a 50% owner of the high grade Pinargozu Zinc Mine which is in production. Under its DSO Program, Horzum AS is shipping directly to zinc smelter / refiners from its mine site in Turkey. The Company has a strong technical management team with many years of experience in mineral exploration and mining project development. The mission of Pasinex is to build a mid-tier zinc company based on building a large land position within a productive CRD district in Turkey. The Pinargozu Mine is included in the 50-50 company, Horzum Arama Isletme AS (Horzum AS), which is a corporate joint venture between Pasinex and Turkish mining house, Akmetal Madencilik San ve Tic. AS (Akmetal AS). Akmetal AS is one of Turkey's largest family-owned conglomerates with the nearby past-producing Horzum Zinc Mine.